They love the Pool. Senko can go all the way to the bottom to get his ball. 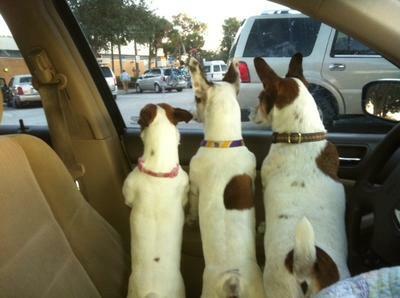 I have 3 wonderful Jack Russells. Yes, I said three! Smitty is the old of the three.He is the protector and the daddy. Daisy is the middle is shy and sweeter then ever. She is the Mommy. And I can't forget Senko. He is the baby and cuddler. 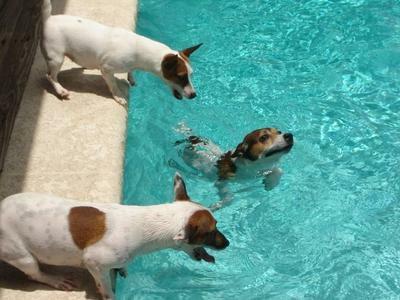 They love playing in the pool and fetching the ball. I don't know what I would do without them. People think my husband and me are crazy for having 3 but I wouldn't have it any other way. Thanks guys! They are our babies! We have 4, yes 4 Jacks, the mommy, daddy and 2 kids. They are just wonderful pets. Everyone thought I was crazy when we bought Roxie, they coudn't believe I bought a dog. I wanted to breed her but could not find a male that was not neutered. So we bought Bandit. It took him awhile to get it right and lo and behold we now have Izzy and Jake (also known as Clemenza). Jake has a recessive gene he weighs almost 50 lbs. He is a beutiful dog and he is huge. If I didn't see him born I would not believe he was from Roxie and Bandit. I guess all I wanted to say is how they make us so happy, they are the most loveable dogs. Granted they need a lot of exercise and they get it so they are very happy. Crazy in love with your jacks.